Photograph courtesy of olumi_day via a Creative Commons license. Smoking used to be portrayed as being glamorous in advertisements and movies. In old films, actors constantly smoked cigarettes and a tough guy usually had one hanging out the side of his mouth. It’s debatable whether smoking still makes you look cool, especially since there are fewer and fewer public places you’re even allowed to smoke. Plus we now better understand the health risks of tobacco products. Tobacco use is the single largest preventable cause of disease and premature death in the United States, but nearly 44 million Americans still smoke cigarettes – 1 in every 5 adults. There are also 14 million cigar smokers and 2 million pipe smokers. Tobacco use is not quite as widespread in California, where just over 1 in every 7 adults smokes cigarettes. In the past year, 61 percent of these smokers attempted to quit. There are many good reasons to quit smoking, and health concerns usually top the list. Half of all smokers who keep smoking die from a smoking-related illness, including lung cancer, other types of cancer, heart attack, stroke, or lung disease. Women who smoke are also more likely to miscarry or have a baby with a low birth-weight. 20 minutes, your heart rate and blood pressure drop. 2 weeks – 3 months, your circulation improves and lung function increases. 1 – 9 months, your coughing and shortness of breath decrease. 1 year, your risk of heart disease due to smoking cuts in half. 5 years, your risk of various cancers (mouth, throat, esophagus, and bladder) is cut in half. 15 years, your risk of heart disease is the same as a non-smoker. Cigarettes are also expensive. You can use a savings calculator to see how much money you would save if you quit smoking. For example, a pack of cigarettes costs $6.77 on average in California. 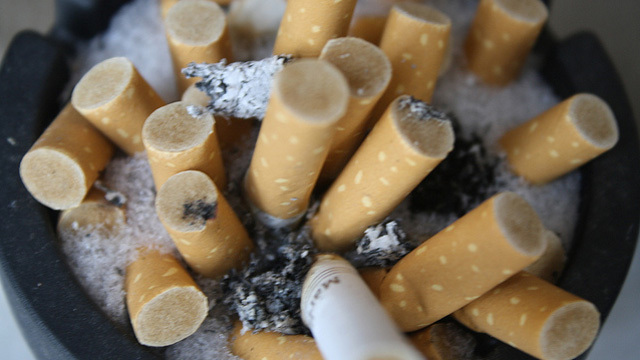 If you smoke a half pack (10 cigarettes) per day, this adds up $24 per week or $1220 per year. Of course, the nicotine in tobacco is very addictive so quitting can be difficult, but the chance of success is increased with help. There are many treatment options used to help smokers quit and many of these treatments are covered by health insurance. The most effective quitting method is a combination of counseling, social support and the use of cessation medication. The most common form of counseling is through telephone-quit lines, which provide free support and advice from an experienced cessation counselor. The counselor can provide a personalized quit plan, self-help materials, the latest information on cessation medications, and social support. For instance, 1-800-QUIT-NOW is a free national counseling service. Many clinics and hospitals also have counselors and support groups that you can meet with face-to-face. Counseling and support groups are also available online. There are a variety of cessation medications that are available either over the counter or with a prescription. Nicotine replacement therapies deliver nicotine to help reduce the severity of nicotine withdrawal symptoms. The nicotine dose is gradually reduced over time. Nicotine gum, lozenges and patches can be purchased over the counter, whereas nicotine inhalers or nasal sprays require a doctor’s prescription. Bupropioin SR (Wellbutrin or Zyban) is a non-nicotine prescription medication that acts on the chemicals in the brain that are related to nicotine craving. It can be used alone or with nicotine replacement products. Verenicline (Chantix) is a non-nicotine prescription medication that blocks the effects of nicotine, so it should not be used in combination with nicotine replacement products. It is important for smokers to speak with their doctor and/or a cessation counselor to make a personalized quit plan that is right for them. And this week is a good time to get started, just in time to take part in the Great American Smokeout on November 21. Smokers across the nation will use this Thursday to make a quit plan, or plan in advance and quit smoking. The Great American Smokeout happens every year on the third Thursday of November. It started in California back in 1976 when nearly 1 million smokers quit for the day, then the American Cancer Society expanded the program nationwide the next year. It has drawn attention to the deaths and chronic diseases caused by smoking, resulting in laws that ban smoking in restaurants and other public places. The Great American Smokeout is celebrated with rallies, parades, stunts, quit programs, and “cold turkey” menu items. For instance, the community is invited to receive up-to-date cessation information, resources and giveaways at UCSF Medical Center’s Great American Smokeout event from 9-10 am and 12-1 pm on their Parnassus, Laurel Heights, Mission Bay and Mount Zion campuses. UC Berkeley is also celebrating the event with a “cold turkey” give-away – get a free cold turkey sandwich in exchange for a pack of cigarettes from 11 am – 2 pm at Sproul plaza.